This British comedy starts off slowly but the hilarity tempo soon builds with tradtional Brit humour. A diverse family has gathered at their parents' home to bury their recently-departed dad. Being a comedy, they're all a bit eccentric in the best British way. There's also a deep dark secret connecting the two brothers and dad. 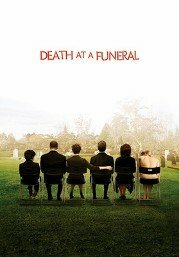 After a mixup with the wrong body, the family set about the funeral, trying to get things to run smoothly while the odd characters threaten to expose the family secret. Comments Strong language but in comic context and moderate in effect. Dark but hillarious comedy.